The Philadelphia Jazz Project is a special initiative started by the Wyncote Foundation and fiscally hosted by Culture Trust / Greater Philadelphia. Its role is to grow the audience for Jazz in Philadelphia and to expand the possibilities for our artists on the local, regional and global scene. One aspect of the work we do is to make music in service to the community. Since late 2016, PJP has quietly been working to develop a collaboration between area medical professionals who have a creative interest in music production and local Jazz musicians, some who have experienced healthcare emergencies and have been serviced by medical professionals. We sought out singers, poets, rappers and musicians who work within the HealthCare Industry to take part in this project. We wanted to engage Delaware Valley Healthcare Workers and Medical Professionals irrespective of job title, or affiliation. Whether they were: federal, state and/or city health center staff, or private/public hospital staff members, administrators, doctors, nurses, pharmacists, physical therapists, imaging technicians, hospital maintenance, or food service staff; all were welcomed. 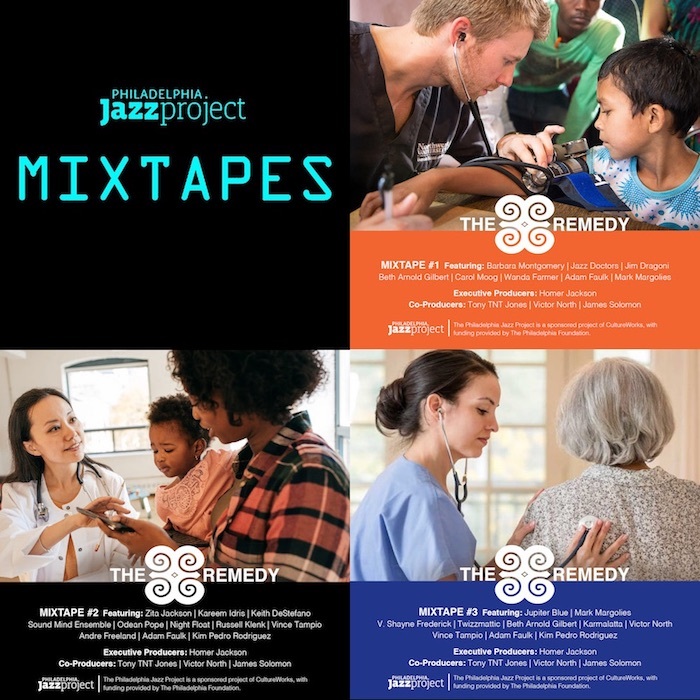 After a lengthy period which included outreach, dialogue, and recording sessions , PJP now introduces our special mixtape project called, "The Remedy." It is a musical collaboration between local Jazz Musicians, Healthcare Workers and Medical Professionals working together to create and interpret classic, as well as new and original music. We wanted folks to share musical performances that speak to their work and lives. This project is truly a way for the music to be in service to the community. It also acknowledges the critical role that these important people, our Healthcare Workers and Medical Professionals play in our personal lives, and in the life of our region. Barbara Montgomery, Tony TNT Jones, Victor North, Odean Pope, Adam Faulk, Keith DeStefano, Kim Pedro Rodriguez and others. To all of the participating artists, healthcare workers and medical professionals, as well as to those individuals whose schedules would not allow their participation in the recording process. You are with us in spirit. To our collaborators at Thomas Jefferson University Hospital and The Hospital of the University of Pennsylvania. To Alex Santilli and Eric Bogacz of Spice House Sound. So now, take a moment and take a listen, to the Arts of Healing.